He is looking forward to Trump persuading Putin about UN peacekeepers in Donbas. President Petro Poroshenko has expressed his expectations from the upcoming meeting of US President Donald Trump with his Russian counterpart Vladimir Putin in Helsinki on 16 July. "Usually I am a very optimistic person. But, unfortunately, I do not expect any positive surprises from Helsinki - and this is bad news. 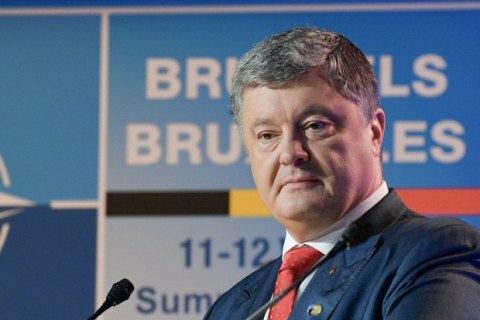 But, at the same time, there is also good news - there will be no negative surprises," Poroshenko said at the "NATO Engages: The Brussels Summit Dialogue" special session "Conversation with NATO Partners". He added: "It will be an ordinary meeting and a beginning of discussion". He noted that the "tone and agenda of the meeting is promising". "Ukraine will be among the main topics of discussion. The policy of non-recognition of the illegal annexation of Crimea will be certainly declared as a position," Poroshenko said, adding that "the beginning of discussion might not bring prompt results". "What do we expect? Point number one - peace. Then - de-occupation. Peace and security package based on the Minsk agreements, which is possible only with the peacekeeping operation under the mandate of the UN Security Council that is capable of protecting people," Poroshenko said. The president suggested that the introduction of this mission would allow saving lives. "Peacekeepers can save from 15 to 27 lives of soldiers and about 10 lives of civilians every single month," he said. "This is the price we pay." He is hopeful that Trump will be successful in negotiations and prove that Russia "has no arguments not to vote for peacekeepers".